Heading east on Whittier Blvd. in East L.A.
On Whittier Blvd. in East L.A., a couple of men sleep. 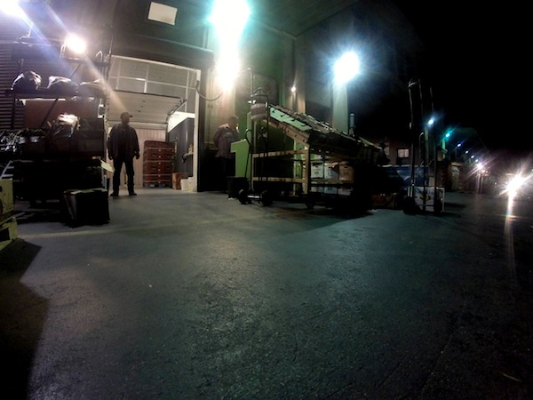 Listo Produce Inc. in the Los Angeles Wholesale Produce Market has donated several boxes of fresh fruit. At 4 a.m., a woman sleeps on a bus bench on Atlantic Blvd. 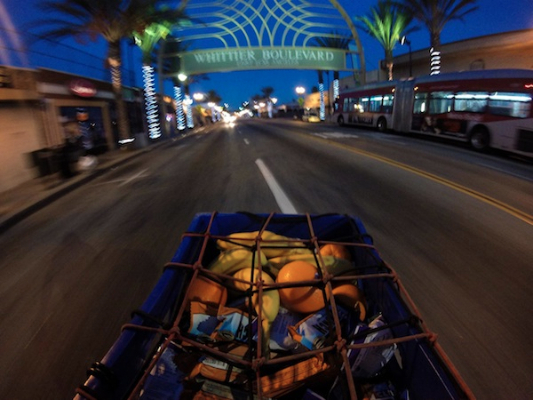 in East L.A.
Barrera packs a plastic crate with fruit and packaged food for his weekly bike delivery. 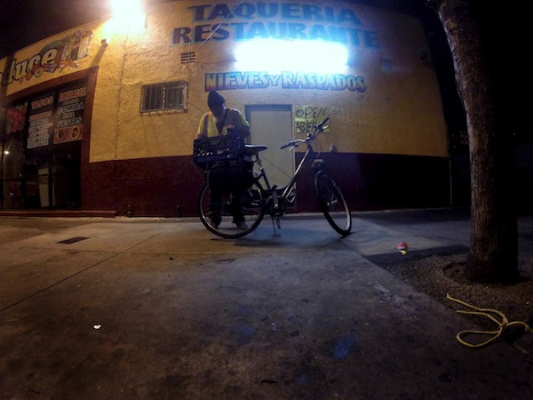 Barrera rides though alleys looking for men and women in need of food. 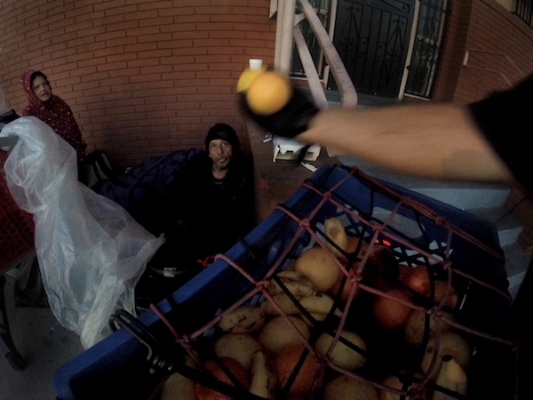 After riding a few miles and making several deliveries, Barrera must redistribute the food in his crate. A homeless woman draped in plastic to keep dry in the light morning fog accepts a few bananas. Diana tells Barrera “Que dios lo bendiga” (May God bless you) as he grabs a banana from his crate for her. 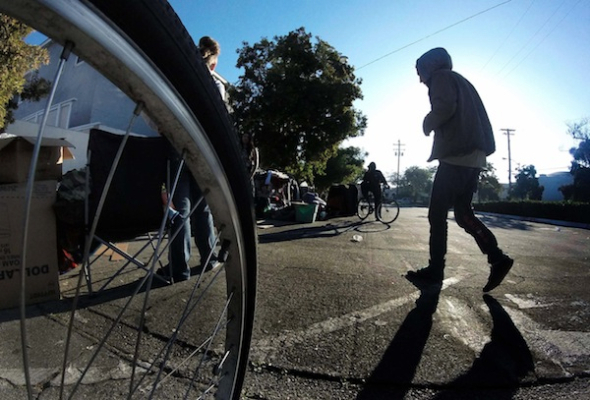 One of the larger encampments in East L.A. is in a parking lot. 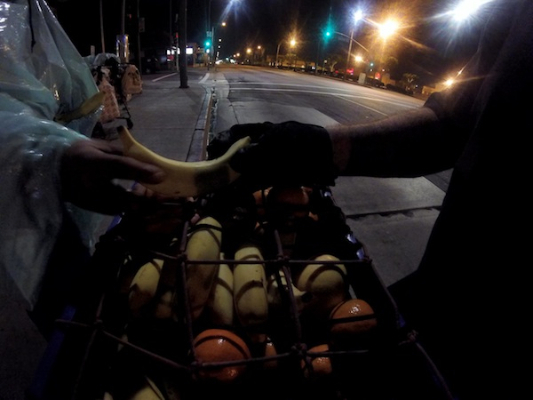 Fruit is offered to a homeless couple in the City of Commerce. Emilio watches Barrera back his bike to the bottom of the steps while four others sleep. Every morning I wake up before 5 a.m. and head out from my house to walk for an hour. 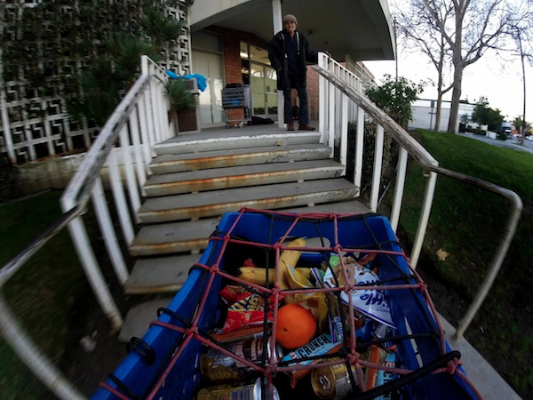 But one or two days a week, I load up my old bike with food that I deliver to my homeless neighbors in East L.A., and in the City of Commerce and Montebello. All the food that I distribute is donated. People who live in my neighborhood allow me to pick oranges, lemons, and grapefruit from their trees. One neighbor, Estel, recently gave me a trashcan full of recyclables to sell. I had just enough to buy a 2 ½-pound container of unsalted mixed nuts. 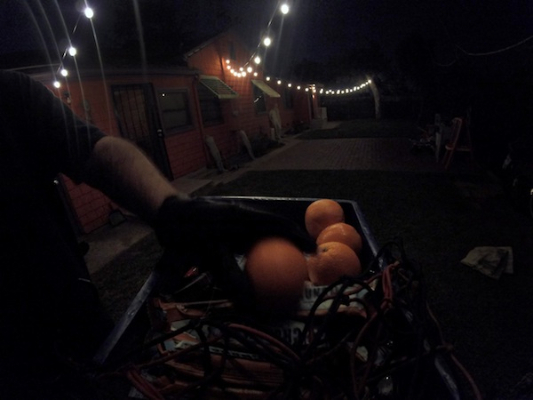 Pedro, who runs Listo Produce Inc. at the Los Angeles Wholesale Produce Market, has donated several 40-pound boxes of oranges, tangerines, peaches, and bananas. It’s still dark when I set out. For two blocks on Simmons Avenue, the only sounds I hear are dogs barking and a rooster crowing. I make a right on Whittier Boulevard and pass by closed restaurants and hair salons, a dry cleaner and a bakery. My bike is loaded with two worn grocery panniers and a blue plastic milk crate—filled with fruit but also water, canned drinks, nuts, and granola bars. I usually have about 30 pounds of food on my bike. 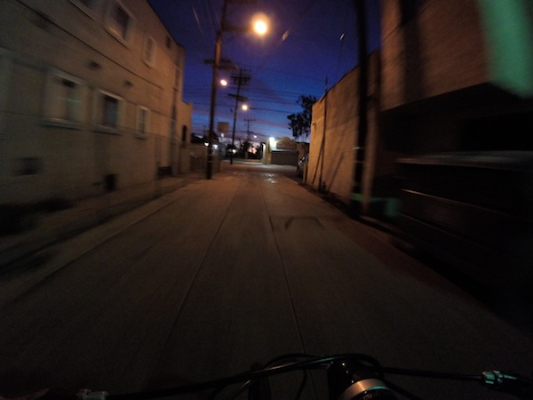 To increase donations, I’ve started to document my delivery trips with a small camera mounted on the handlebars, the front fork, or behind the seat of my bike. My first stop, only five blocks from my home, is the bus bench near a McDonald’s restaurant on Whittier Boulevard. Most of the time, I find Diana already awake. I always greet her with a loud “Buenos dias!” to make sure she knows I am a friend. She looks at me through her neon orange sunglasses and smiles. I hand her a banana, a drink, and some packaged food. “Que dios lo bendiga” (“God bless you”) she repeats several times in her raspy voice as I ride away. After leaving Diana, I ride to my next stop where two men sleep in front of a shoe store. One man I have never spoken to because he is always either sleeping or pretending to be sleeping. The other man sometimes says good morning and takes some food. Other days, he curses at me. I back away and tell him that I am leaving food. 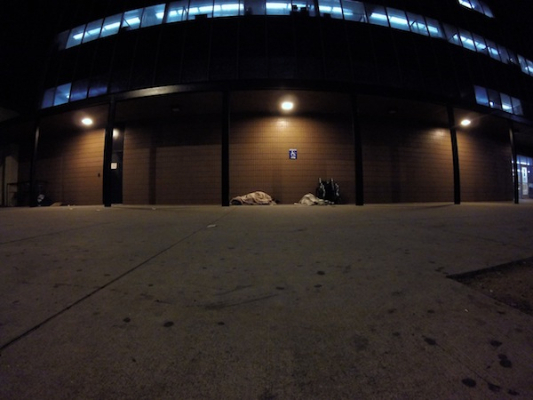 I ride my bike though dark alleys looking for men and women sleeping in back doorways, beside trash bins, on stairs, or anywhere else they find to stay as warm and safe as possible. On some days, I need to squeeze between delivery trucks that are being unloaded and a wall or a fence. By about 7 a.m., I have usually ridden about 10 miles and am running low on food. I head to the final encampment in a parking lot behind a couple small restaurants and discount stores in East L.A. on my way home. 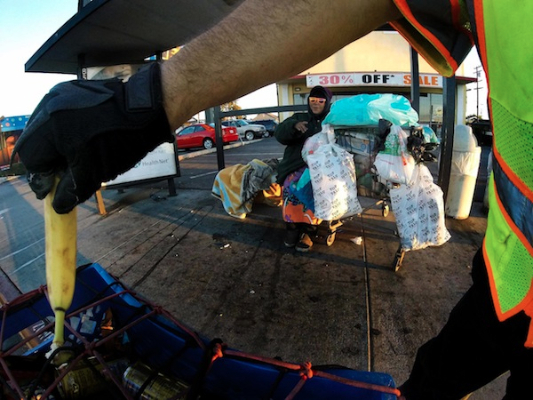 There are shopping carts, mountain bikes, lawn chairs, and tents made of bed sheets that house up to nine people. One of the men takes everything left in my crate and passes it out to others still lying under blankets. As I ride away, I am happy that, with the help of friends and neighbors, I can deliver food to hungry people who appear to be increasing in numbers on our streets but whom we often don’t notice as we rush off to work or school. This part of my day is done; I ride home to make breakfast for my daughter. *Photos courtesy of Aurelio Jose Barrera. Aurelio Jose Barrera is a stay-at-home dad and grandfather who worked as a photojournalist in the Los Angeles area for over 25 years. He is raising funds to get a cargo bike to deliver more food and expand the area he serves. To donate, please visit http://www.gofundme.com/fruitbybike. 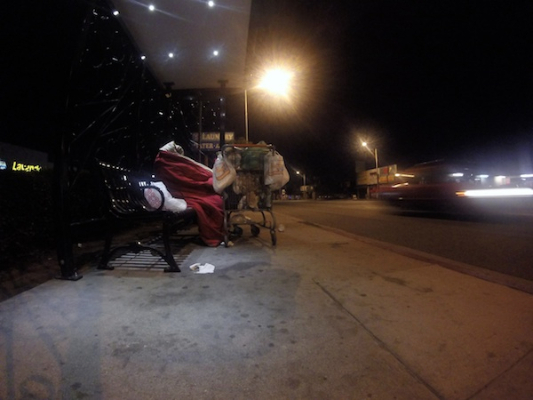 charity, Food, homelessness, Thinking L.A.